This last Saturday we decided to go to the lake with the Almonds and the Atwoods. It was a perfect and super relaxing day! 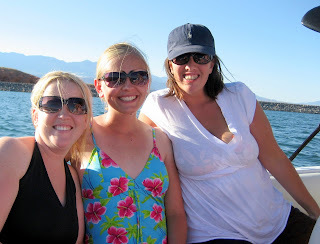 Here's Me, LeAnn, and Kim...we are all 4th grade teachers at Iron Springs Elementary! I am so lucky to have such fun girls to work with! 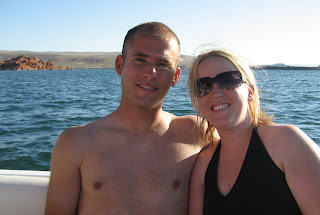 And last but not least here is my super hot hubby cliff jumping! What a blessing to have jobs that give us two and a half months off to spend together as a family during the best season of the year...SUMMER! Greg and I have had so much fun this summer already hanging out with our little guy! He just turned six months old and his personality is really coming out! He is always smiling and has stared to really laugh, which I love! He thinks Boca (our dog) is so funny...he loves to just watch her and always smiles when he see her. 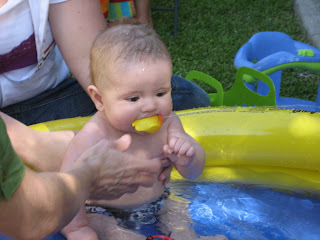 He loves to be outside and loves water whether it's the bath or the lake or a pool. 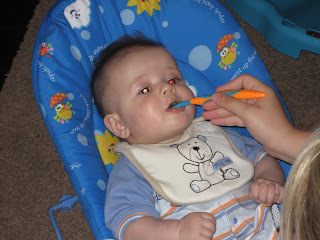 He's on the verge of getting his first two bottom teeth...which has been hard on him and on me. He adores his dad and Greg adores him too, which is the sweetest thing to watch. 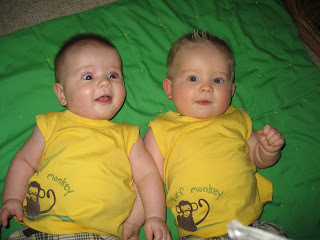 I couldn't feel luckier to have these two boys in my life! Here's a few pictures of what we've been up to this summer...swimming, boating, and seeing family! 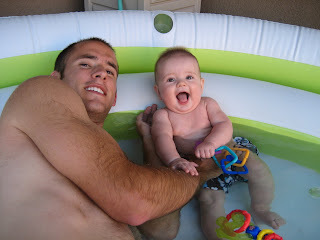 Greg and Maddux hanging out in our blow-up pool in the backyard...we fill it with warm water from the washer and Maddux loves it! 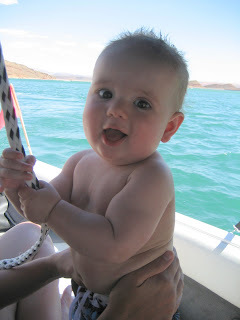 Maddux at Quail Lake on our best friends boat. He's practicing holding the rope so next summer he can wakeboard! 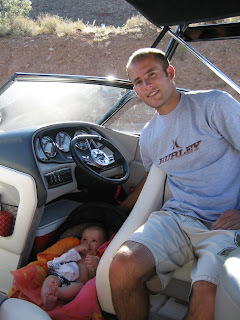 Maddux hanging out with Dad in his favorite spot on the boat...under the steering wheel where it's cool and shaded. 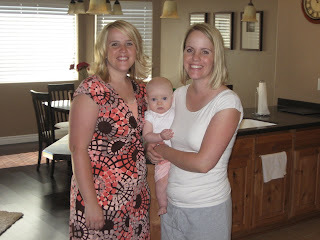 Me, Audrey, and Janae when they came to visit us in Cedar! 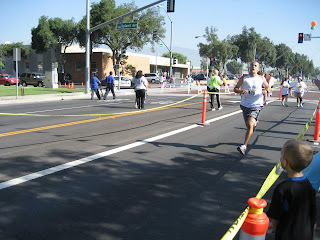 Greg and his Dad ran in a half marathon and both did so good! Greg finished in 1hr and 12 min!! He's such a stud! It was fun to take the boys to cheer him and Grandpa on! 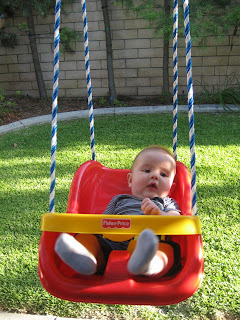 Greg's parents hung this cute swing in their backyard and both Maddux and Taryn's little guy Nate LOVED it! We got one to hang in our backyard too! 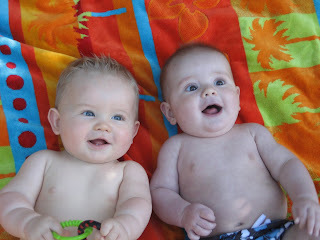 One of my favorite things we did was take the boys swimming in a little blow up pool in the backyard...after we put them on a towel to get some pictures and they turned out so cute! Isn't it crazy how different they are...Nate has adorable blue eyes and blond hair while Maddux has dark brown eyes like his dad and brown hair! Both are just too cute if you ask me! While they were swimming this was Maddux's favorite toy...it's a little fish we would fill with water and then put in his mouth and as you can see he would bite down and squeeze all the water out...it was so funny! 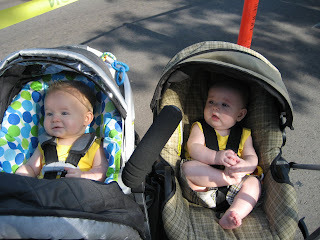 Both boys at the half marathon cheering on Uncle Greg and Grandpa! 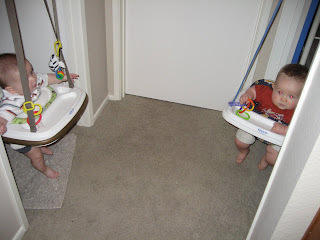 Playing on the floor while wearing thier cute matching outfits from Grandma! Maddux got to meet his Uncle Ryan for the first time! 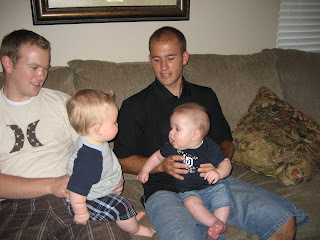 Here are both Dad's holding their sons...so cute! Maddux is 5 months now and has so much personality! We are both home with him for the summer and are loving spending all our time with him! 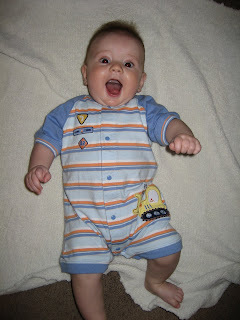 He has turned into such a easy baby...he hardly ever cries and is constantly jabbering and smiling his huge smile! We feel so blessed to have such a sweet little spirit in our home. Here are a few of his favorite things these days! He got an Excer Saucer for Christmas and we recently put it together and he loves it! It's so fun to see him figure out how all things work. His favorite is the spinner he hits it over and over to make it spin! He also loves to eat now! I only feed him once a day and I think he gets more all over his face and bib than actually in his mouth but he's learning! He get so excited when he see me with a spoon and food. He starts kicking and reaching for it! He also loves to just lay on the floor and talk to whoever will give him attention. He still loves to be sang to and read to. I keep expecting him to start rolling all over the place but he hasn't yet. He can roll and does every once in a while but it's not all the time. By far though his favorite toy is his jumper. 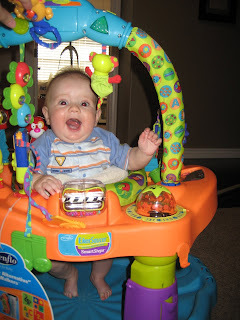 He gets so excited when he's in it and will laugh and make noise and jump really high. 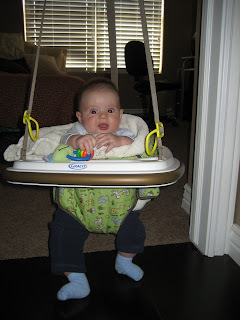 It entertains him longer than anything else...it seems like he would get bored of jumping but he just LOVES it! The coolest part is that it's not very big and it fits on any doorway so we take it with us alot...like on vacation and stuff...it's really handy!